I ate a lot of food in Cartagena - and I'm not upset about it at all. The combination of a great exchange rate, a pretty cheap country, and seriously spectacular food means you should spend a lot of time eating. Below I have listed everywhere I ate, what I thought of each place and if I can I have provided some links to menus for you to look over. Of course, please keep in mind there are so many amazing restaurants in Cartagena. This list barely covers what the top restaurants in Cartagena are. Don't be put off by the very clean and trendy looking interior.... the bread here is fantastic because it is truly local. This is a great place to stop in for a quick bread and empanada with a coffee on the side. Counter service only. It's also very cheap which makes it great if you are traveling Colombia on a budget. I've included a picture that has everything I tried labeled. (Thanks insta stories). 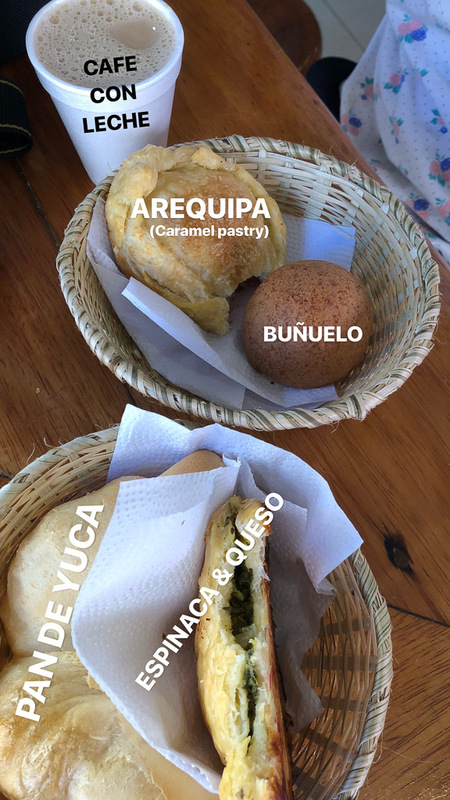 I highly recommend the Bunuelo. Seriously don't miss it. It's just fried bread but it basically tastes like a cake donut. Aka... it's delicious. Pan de Yuca is also really high on the list of a must try!! One of the best places we ate at while in Cartagena - this restaurant/coffee house is located in the hipster neighborhood of Getsemani. The food is delicious, especially for breakfast. Do be aware that service is extremely slow. This is because they hire the poorer kids of Cartagena and work on teaching them basic skills so they can move up in life. This was one of our first stops when we first got to Colombia. We needed something to fuel the day and this was perfect! The coffee here is delicious and the cakes are delightful. Don't miss it. A gorgeous coffee shop with some of the best coffee in town. If you want some good breakfast food as well, they have a small restaurant that serves food - the main location is just coffee and cakes. The restaurant is around the corner but serves the same coffee. I put this under Cafes but the food here is amazing as well. We ended up coming twice in a 24 hour period - this place is that good. Don't get a normal cup of coffee. Instead, opt for one of the extremely cool brewing experiences. We tried the Chemex and the Freta. The former was for hot coffee and the later for ice coffee. Both were extremely cool and it's awesome to learn so much about the coffee and region while you are watching it brew. Also, these brewing processes aren't expensive! Each one makes 2-3 cups of coffee and cost about $5-7 per brew. 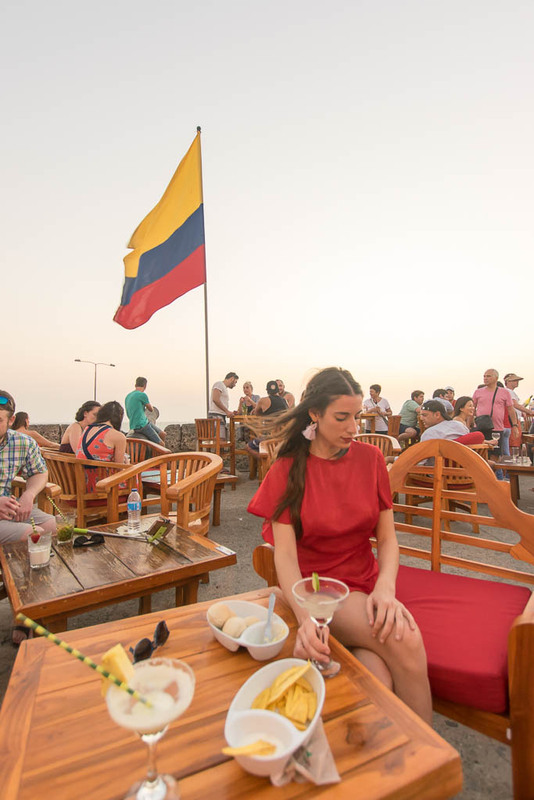 Look up any list of the best places to watch the sunset in Cartagena and this place is at the very top. With tons of seating, literally on top of the UNESCO World Heritage walls, you really can't go wrong. We actually got here only 40 minutes before sunset and were still able to snag a seat. Obviously the earlier you get here the better view you get. They also take reservations. Drinks are pretty good here, and the food was surprisingly fresh and delicious! I assumed it would be gross overpriced bar food. Still though, with all the amazing food in Cartagena I would stick to just grabbing a drink here and heading to dinner after. While this hotel seems unassuming from the outside head to the rooftop for an amazing view of the main square with the clock tower as the sun goes down. It's the perfect place to grab a beer and people watch after a long hot day. I mean just look at that view! One word: amazing. This was our first meal in Colombian and highly recommend it be yours also. It's a nice introduction to real Colombian food in a trendier (but not too much pricer place). Also, their coco lemonade was the best I had in the city. And you should definitely try lemonade in Cartagena, it's really special here. One of my best tricks for enjoying the best views from upscale hotels without paying for it (I mean who has $400 to drop on a room?) is booking dinner at the best hotels. And if you can't afford dinner either (I've been there) just head up to the bar for the cheapest drink on the menu. We actually went to the Movich for some drinks (and to try and sneak into the pool) during mid-day but ended up staying the whole day. The views were that good. We tried the ceviche and Oh. My. God. (said like Janice from friends) it's amazing and seriously not too expensive! Obviously, there are only so many meals I can fit into three days. But, Cartagena has so many amazing restaurants to try. Trying to pick a top restaurant in Cartagena is HARD. So here are some more places that were on my list and I never had a chance to visit. 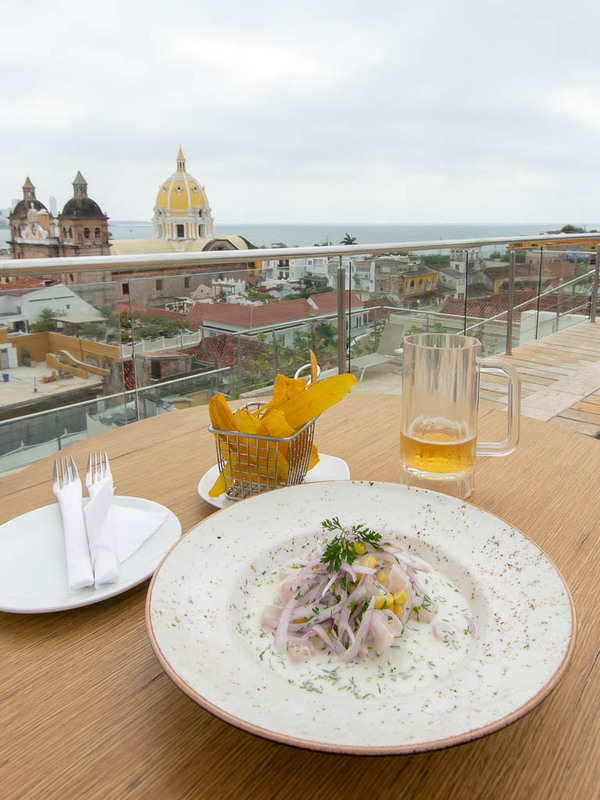 Said to be the best Ceviche in Cartagena. We never made it (and instead had ceviche at Movich Hotel rooftop which was amazing) but if you can you should try it! Ice cream shop that has so much different types to try. Great on the hot colombian days. If you want an upscale experience try this place. I suggest getting a reservation ahead of time. Said to be the very best in Cartagena we couldn't get reservations for this place. Do know that it is expensive but (supposedly) worth it.